My 14 Miler and the Tucson Marathon. I had business to attend too over near a subdivision called the Islands. No, there's no islands, but it does have two beautiful lakes and the main drag makes a nice little 4 mile loop around them. I added some mileage in the park to make it about 4.5 miles. My plan was to run it three times and then add some mileage to get up to 15. The weather was just about perfect. My run started around 2:30 in the afternoon and the temps were about 60 degrees with a slight breeze. It dipped into the 50's at the end with stronger winds and a sprinkle or two. I started out on the newly slurried asphalt streets, but I was running on the side with no sidewalk. For safety sake (I tend to daydream), I moved over to the sidewalk. Concrete, dips at streets and driveways, some fake cobblestone made rougher running. On the other side of the road was a woman running on the asphalt. I was run/walking so she slowly pulled away from me. She didn't take any walk breaks for the first couple miles, but she did stop at a stoplight. I ran right thru it, there wasn't much traffic. But, she caught me about a half mile down the road and pulled ahead. At the second stop light, she paused ever so briefly and then jay-ran too. My goal was to do as many 12 minute miles as I could. Just like I was doing for Twin Cities. The first couple miles were done in 22:05 or there abouts. 12 is hard to do in the beginning. Then I started staying in the 11:30 to 12 range and I was happy. I only had one bad mile and that was mile 14. The clouds looked dark, I was tired and my ankle was complaining. And I was at my car. So, I called it a day. The Tucson Marathon is just 44 days away and I need to figure out what pace I should run it. It's mostly downhill and there's no way I'll be able to hold back at a 12 minute pace, unless I walk alot more. I'm thinking I'll be running around a 9-9:30 minute pace. Add a few walk breaks per mile and my average will be around 10 to 10:30. But, will that burn me out? I know I can do it for a half marathon. In mid November there's a training run on the first half of the marathon course. You park near the Biosphere and Bluepants Racing will shuttle you to the start line. They have water stations set up and you run back to your car. Sounds like this will be perfect for me. At Twin Cities I average 13:05 per mile and I felt tired the last few miles, but not dead. I'd like to think I can do a 12 minute average per mile on a downhill course like Tucson. That would shave 30 minutes off of my run. An 11 minute pace would shave an hour off my marathon time. I know those are lofty numbers. If Tucson was flat I would hope my extra training would get me to around 12:30, but it's not and I think the course will help me a lot. I guess the training run in November will answer my questions. November 8: Phoenix 10k/5k. I'm running both races back to back. November 26: Mesa Turkey trot 10k. December 13: Tucson Marathon. 26.2 miles mostly downhill. January 9: Kyrene de la Paloma 5k. 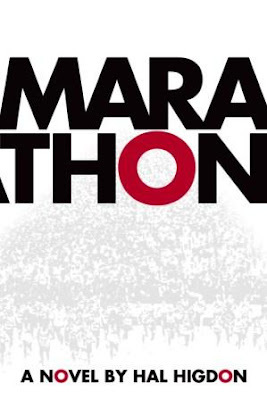 January 17: PF Chang's Rock N Roll Marathon. March 28: Bataan Memorial Deathmarch. A marathon. Tenative Schedule. I'll probably add some 5ks along the way. Who wants to join me? Pat Monahan's finish at the 5:47:28 mark of the Twin Cities Marathon. It's at the 10:25 mark on the video. I'm the guy throwing his hat in the air, ala Mary Tyler Moore. Jeff Potters finish at the 3:52:42 mark of the Twin Cities Marathon. Two Marathons completed in 11 days! Much thanks to Hal Higdon, the Runner's World contributing editor and author of many marathon training programs in helping me complete two marathons in just 11 days. Many of you know about my running of the Twin Cities Marathon on October 4th. It was a run I had planned since early in the spring of 2009 and after an ankle set back and a tweeking of my training, I completed much to my surprise. But, you don't know that I met Hal at the Health and Fitness Expo in St. Paul the day prior to the race and that is when Hal assisted me in getting the second "Marathon" done. Hal Higdon is the author of 35 different books and training guides and is best know for his virtual training guides you can buy online that will get you to finish a marathon. His latest work is a novel titled, "Marathon" and that is the second marathon I speak of. You didn't really think I ran two marathons that soon? Marathon, the novel is a great book. I got copy number 336, autographed by Hal himself. It's a story about a race director and his new love, a big city marathon that is in jeopardy of losing it's sponsor, first time marathoners and the whole marathon experience. Finally, there's a secret celebrity runner too. As a marathon runner, you'll have deja vu moments as you read each chapter. Read Hal's new book right before your next big marathon and you too, can complete two marathons in 11 days (it would have been faster, but I had to complete another book first). Amy planned this 3 day visit to see two colleges in the LA area for our daughter. The day before I checked to see if there were any races that weekend. The Long Beach Marathon was scheduled, but since I ran a marathon a week ago, I didn't think that would be a good idea. Then, I saw it. The Santa Monica 5000. A 5k race just minutes from our hotel on Sunday morning. It was a bit overcast and in the low 60's at the start of the race. About 800 runners were planning on running the 5k that started south of the pier, looped around and thru the downtown section and then past the pier for another loop to finish at the pier. I did it around 33 minutes. Not anywhere near a PR, but it was fun anyway. The cool Ed Hardy shirts were given after the race at the small expo on the pier. My daughter knew who Ed Hardy was. I had no clue. Below are a few pics from our LA trip. First is one of the Japanese Gardens north of Santa Monica. We, also went to Little Tokyo in downtown LA. A sailboat at Santa Monica beach. Running past the Santa Monica Pier. The shirt I got is like the one the lady is wearing. Hey, that's the ocean out there. Me at the finish. I need to practice putting my bib on straight. Check out the elevation gain in the first mile. I think I know what caused that. As we run in downtown Minneapolis, the county court house (403 feet tall) is on both sides of the street and is literally over the road. You run in a tunnel for about a block. All the runners howl, which is kinda cool. I think the building interfered with my garmin and showed my run as if I had climbed over the building. My mileage was off most of the day too and I finished with an extra half mile tacked on. Some random pictures from the TC Marathon. This is the Basilica of St. Marys in downtown Minneapolis. The bells were ringing as I ran by. Not sure why this deer was on the course. But, I got a picture with him. The ING orange hat was a freebie at the expo. I ended up tossing it in the air at the finish, just like Mary Tyler Moore. The wall at mile 20. I gave it a Mike Tyson double punch as I passed. Soon the hills returned the favor. It has to be one of the great finishes in all marathons. You pass under the huge US Flag courtesy of the fire department and then it's downhill straight away to the finish in front of the state capitol. Up until about a week ago, I didn't think I would finish this race. The day before I left Arizona, I thought I had a 25% chance of finishing it. My bail out points were at 15 miles (the light rail stop) and 19 miles (the Franklin Bridge). I passed both without considering quitting. The first 14 miles were easy and a bit faster than I had planned. Thanks to the cooler temps (Minnesota is cooler than Arizona) and the great crowd support. I will have a full race report soon. But, to end. I finished at 5:42:27. Nine OH Seven (not really why I named my blog 9:09) faster than my first marathon. So, I went from a DNF to a PR. Wow!